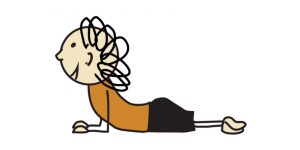 illustration of child in snake pose yoga posture. child is lying on tummy, head up & looking forward, smiling, using arms to prop themselves up. elbows, forearms & hands are flat on the floor in front of them.